The mountains of Aoraki Mount Cook National Park and Westland Tai Poutini National Park contain some of the best mountaineering and transalpine tramping in the world and make up New Zealand’s most popular alpine climbing region. 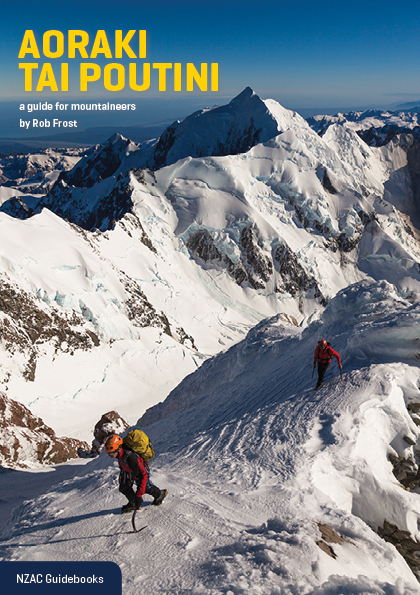 These two national parks are covered in their entirety in this latest edition of the New Zealand Alpine Club’s top-selling mountaineering guidebook. All new routes recorded since the last (2001) edition are included, and specific attention is given to how the mountains and access routes have been affected by climate change. The expanded coverage area now includes the lush, rugged, and previously overlooked valleys on the west side of the Main Divide, including the Callery, lower Balfour, Cook/Weheka, Copland, Douglas, and Karangarua catchments. Because information on these valleys has been difficult to find for so long, they still host several major unclimbed features. There is also a new chapter on climbs from Aoraki Mount Cook Village, for those passing through with only a couple of days available for climbing. The author’s love for New Zealand’s mountains, fascination with climbing history, meticulous eye for detail, and passion for engaging with climbers has resulted in an up-to-date, reliable, and comprehensive guide – the definitive guidebook for the Aoraki-Tai Poutini region.